This week, I bring you two fabulous Frappuccinos. These should be listed in the “best of” the secret menu, if there were such a thing! Know how to order your drink. Sorry that’s a little difficult to order, but I trust your experienced barista will quickly be able to decipher that. 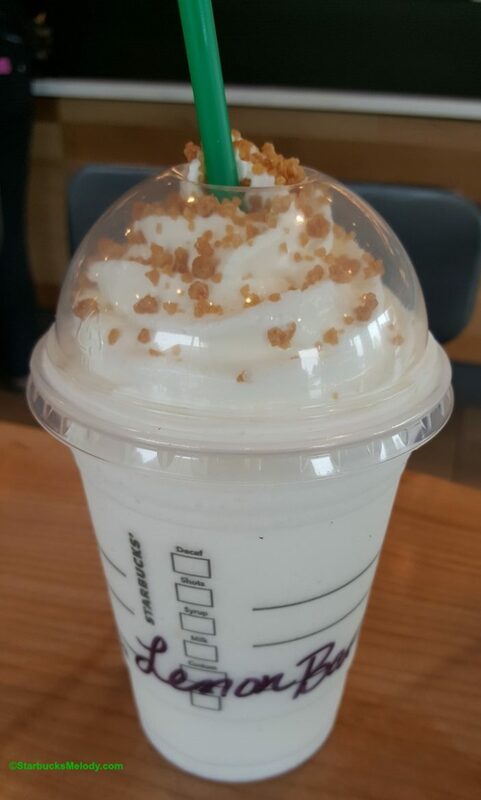 If your store has run out of the caramel sugar topping, your Lemon Bar Frappuccino will be handed off with just whipped cream only and no alternative topping. The cup marking should be “LBCF”. The first drink comes to you from Kari, in Orange, California, and it tastes like one of those strawberry push up pop type treats. Order a Tall Strawberries and Crème Frappuccino, but no dairy, substitute passion tea (just the tea without water added). Add one pump of raspberry syrup. This Frappuccino comes out light and fun, perfect for hot summer days It’s also a no dairy drink, for those who have a milk sensitivity. If you want to order this in the Grande size, ask for a strawberries and crème Frappuccino, no milk substitute passion tea, with two pumps of raspberry syrup. The Grande size gets one more pump of syrup than the Tall size. 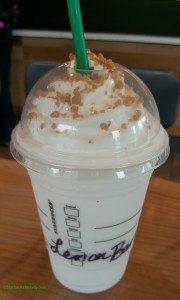 The Strawberries and Creme Frappuccino normally has classic syrup in it. This Frappuccino adds the raspberry syrup in addition to the classic, just in case you need to clarify that at the register. This drink separates a little on the fast side so don’t hesitate to enjoy your drink! Thank you Kari for the fabulous Frappuccino! 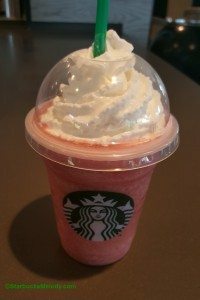 The Strawberry Push Up Pop Frappuccino is not in any way, shape or form a Starbucks-created drink. You will always have to explain the recipe to your local barista. 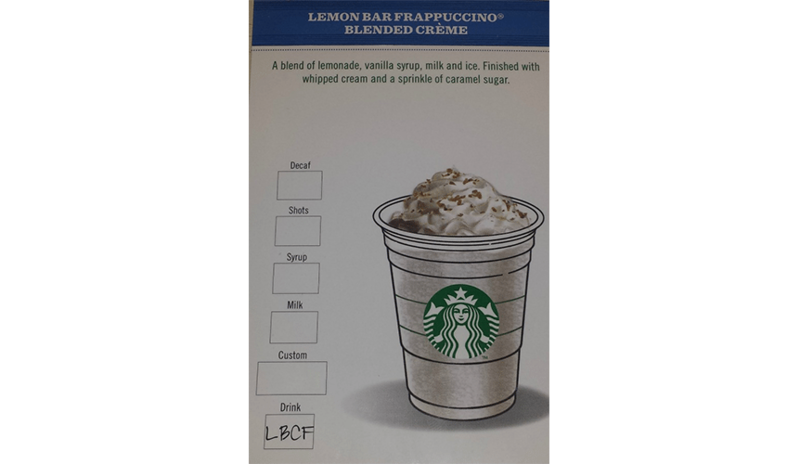 The Lemon Bar Frappuccino is a Starbucks-created drink, and has its official start date as June 8th. There are a few other fun Frappuccinos coming, but I think I’m just going to leave you with this one. I would love to hear from you! What’s your favorite creative Frappuccino? I’m sending Kari a $10 Starbucks Roastery card as a thank you for me using her drink (the Strawberry Frappuccino drink). 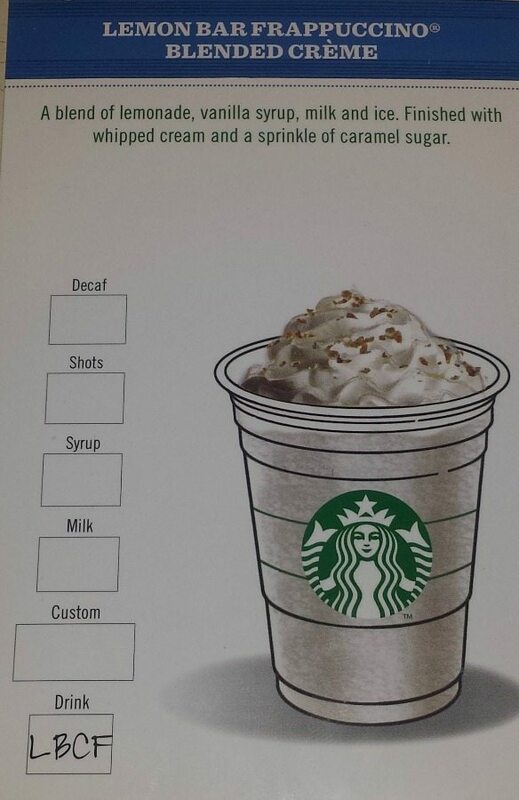 If you submit a Frappuccino beverage to StarbucksMelody and I feature it here, I will send you a thank you. 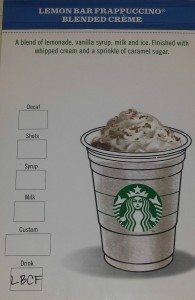 To submit to this Frappuccino of the Week column, here’s what you need to do: Email me a photo of your Frappuccino (when the drink is full, before you’ve started drinking it), and include detailed information on how the drink is made. Please introduce yourself and let me know if you’re a partner or a customer. Tell me a little bit about yourself – if you’re a partner, I’d love to know if you are a barista, shift, ASM, or SM. And I’d love to know if you’re a coffee master. I repeat. Know the recipe when you order! In the news: Starbucks Partners with Spotify. The strawberry push pop sounds so good!! I’d leave the raspberry out of mine though, and perhaps sub in classic syrup. (Raspberry syrup just tastes like cough syrup to me!) :p Thanks for sharing, Kari! @Rachel – Let me know what you think. I really liked it and it’s fairly easy to order, which is one thing I like. The thing is that any time you put tea in a Frappuccino, it separates faster than milk. This was one of the major problems of the Pink Lime Frozt, which used Passion Tea in it too! My Starbucks told me today they will be rolling out the lemon and a red velvet(??) frapps starting June 8th. It seems like maybe the red velvet is a test flavor? @Paige – On June 8, there will be six new Frappuccinos. I only wrote about the Lemon Bar one, kind of leaving the rest as a surprise. 😉 So there will be 1) Cotton Candy – which most every barista already knows the recipe for 2) The Lemon Bar and you guessed right! 3) there will be a Red Velvet. I know all of them but there are 3 more that will still be a surprise! Ooh, exciting! I can’t wait to see what the others are. Went to Starbucks to get the Lemon Bar Frappuccino and I was told that it was not available that we are suppose to vote on them only. Which made me sad until I saw your post. Went back to the Starbucks and showed them your post and now I am sipping on heaven. Thank god someone is paying attention. I tried the cotton candy, lemon, and cupcake fraps. Here are the others. I work at a Starbucks corporate account. @Yvette – Glad to hear you’re a partner! This was an article from a few weeks ago. Hi, you came into the Starbucks I work at today, 40th floor Columbia Building, and ordered a mocha with milk chocolate sub. (: So I was very curious of your website, so here I am, very much enjoying it by the way. But with the strawberry push up, I was wondering if you’ve talked to a partner about what base they use since it’s not coffee or creme based?